Making jalapeño poppers at home is ridiculously easy and only requires THREE ingredients! A huge party hit! Preheat oven to 450 degrees F. Place a wire rack on a baking sheet OR line a baking sheet with parchment paper and set aside. 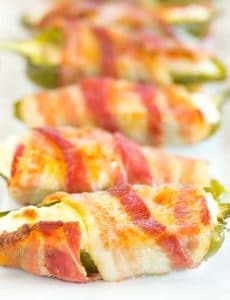 Spread cream cheese in the cavity of each jalapeño half, then wrap with bacon (depending on the size of the jalapeño, you could use a whole piece of bacon, or half). Place on the wire rack or baking sheet. Bake for 20 to 25 minutes, until the bacon is done and crispy. Serve immediately or at room temperature.